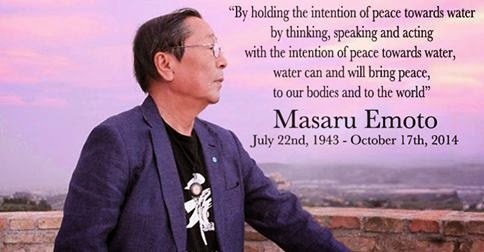 I'm not sure if you've ever heard of Dr. Masaru Emoto but I feel compelled to share his work. He passed away on the 17th at age 71 ~ much too early. He left an amazing legacy for all. “He was so grateful for the friends he made throughout his life. He thanked you all so very much.” said his wife Kazuko Emoto. “In his last book, 'Hidden Messages From Water and The Universe', he wrote, ‘Life is love, which is a gift from God and parents, and death is gratitude for going to a new dimension’. So now he is in another dimension and continues to look over us warmly with love and gratitude.” she said. I invite you to check out more information about him here. Arigota, Dr. Emoto ~ may you rest in peace. Oh Pat, I can always depend on you to open up my horizon when it comes to the topic of gratitude. The fact that you are drawn to such deeply kind souls says so much about you and your own heart. Yes, this is a man whom I need to know more about. Thank you for sharing this today and thanks for always being such a light in my blog life. Your comments and visits to my blog continue to mean so much, and today I'm so very grateful for you too. I am not familiar with him but I will go read about him. Enjoy your day dear friend, HUGS! I didn't know about him but I am a big fan of anyone working for peace.